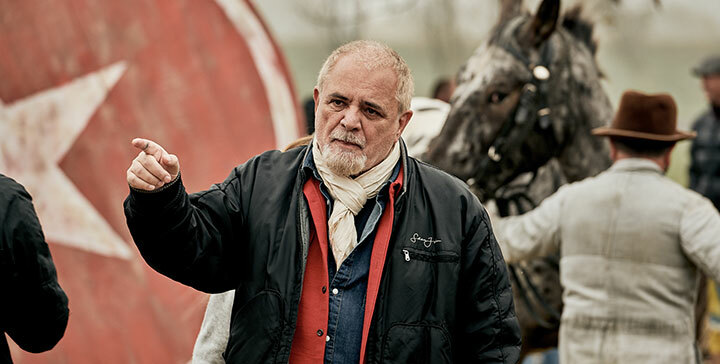 German actor Jonas Nay and director Uli Edel sing the praises of their collaboration on The Master Butchers Singing Club, which tells the story of a family who move from Germany to the US in the wake of the First World War. Whether by accident or design, it’s a path that’s working pretty well so far for the German actor, who has appeared in Tannbach (Line of Separation), set in the aftermath of the Second World War, and then became the breakout star of Cold War-era drama Deutschland 83 and its recent sequel, Deutschland 86. For his next role, Nay has travelled back further in time than ever before. He stars in The Master Butcher Singing Club, a four-part miniseries based on the novel by US author Louise Erdrich and adapted by Doris Dörrie and Ruth Stadler. The story begins in Germany in 1920. After his return from the First World War, young master butcher Fidelis (Nay) marries Eva (Leonie Benesch), the pregnant fiancée of his fallen friend. But since his family’s butchery can’t provide for all of them, Fidelis soon decides to emigrate to America. In Argus, a small town in North Dakota, he builds up his own business and a home for his new family. And while Fidelis starts a German singing club to fight his homesickness, Eva finds a piece of home in Delphine, a young circus acrobat who is stranded at a nearby farm with her father Robert, a clown and alcoholic. But when Eva falls sick, the future of the entire family is at stake. Nay describes Fidelis as a man who is never happy to settle and is always striving for more – an attitude that leads him to move his family halfway around the world after returning from war and finding there wasn’t a place for him. Its then in North Dakota that the drama’s themes of identity and home are established, as Fidelis brings together a disparate group of characters all longing to build a bridge between their new home and their old one. Still living in his home town of Lubeck, in the north of Germany, Nay used a dialect coach to help him adopt Fidelis’s accent, with the character hailing from the Black Forest region in the south-west. But he didn’t need any help when it came to the singing scenes, as Nay is an accomplished singer and musician who also composes scores for film and television. Edel says he wasn’t looking to hire singers but rather cast the best actors possible. So when Nay revealed during his audition that he was in a band, it was a welcome moment of serendipity. As for the singing, Edel admits The Master Butchers Singing Club is a “much more poetic piece,” compared to the fast-paced Baader Meinhof Complex, his 2008 feature film about the early years of a West German terrorist group in the 1960s and 1970s. The Master Butchers Singing Club is produced by Moovie in coproduction with ARD Degeto and SWR. Global Screen is the international distributor. Having grown up in the Black Forest region, Edel says he felt very close to the show’s main character and its premise, having also left Germany for the US 28 years ago. “I could relate to these characters John Steinbeck called ‘the salt of the earth,’ and their sentiments, on many levels, and I tried to give them the respect they deserve,” he says. The director had hoped to shoot the Dakota sections of the series in Canada, but budget restrictions forced the production team to scour Europe for an alternative to the US state’s panoramic landscapes. The decision was then made to build the set on location in Croatia, where the environment was comparable to the US Midwest. Nay describes Edel as a “visionary” who has a clear idea of the way he wants to capture individual scenes and how they make up the drama as a whole. “It’s really rare that a director has one whole series in his mind,” the actor says. “He always stuck to it. He worked on it until he got there. Now I’ve seen it, he’s a genius. It works in every moment. The Master Butchers Singing Club is set to debut in June at the Munich Film Festival. Meanwhile, Nay is now back in the music studio before production begins on Deutschland 89, the third and final part of the Cold War trilogy.